Temple of Hathor at Dendera, built by Pharaoh Pepi I ca. 2250 BCE has carvings of Vanaras (as described in Valmiki Ramanaya), snakes, eagles, dogs, hippos with human bodies. Evidences prove ths temple’s existence since 1500 BCE. It is historically called as the Temple of Tentyra. It has been modified on the same site during the Middle Kingdom (2030 – 1650 BCE), and continuing right up until the time of the Roman emperor Trajan. The existing structure was built around the late Ptolemaic period (300 BCE). There are numerous structures and elements in this temple, but the most striking are Vanaras (monkey faced humans with tails as in Ramayana) and Ancient Light Bulb of Egypt. Ceilings and walls of this Temple of Hathor has many structures and paintings. They show dogs, snakes with human like legs, monkey faced humans with tail, different animals like hippopotamus, eagle etc with human bodies seen along with humans. Ramayana, the first poem in this world, composed by Valmiki, describes that Lord Brahma, the creator, ordered devas to send their energies to earth and few new races like Vanaras, Rikshas (Jambavan was Riksha-Raja) were created by mixing genetic material of celestial beings. They had mighty physiques and super-human power+stamina to fight long wars. The term Vanara can also be described as forest-dweller (vane carati iti vanara). So, this must a special species and described as group of monkey-like humanoids. The epic Mahabharata describes them as forest-dwelling, and mentions their being encountered by Sahadeva, a Pandava general who led a military campaign to south India. Infact, Vanaras were genetically engineered from multiple species. In picture above, a Vanara is shows 2 knives in front of a light bulb. Appearance of this Vanara matches with the description in Ramayana. Kishkinda-Kanda of Ramayana indicates that Sugreeva ordered all subraces of Vanaras from all over the world to assemble in his capital. They were divided into 4 teams and sent into 4 different directions to search for Seetha, who was kidnapped by Ravana. Within few days, almost 2 crores (20 million) Vanaras assembled in Kishkinda and later they all of them marched on Rama Sethu to reach Lanka and fight a war for 7 days, 7 nights with Ravana’s army. Few must have arrived from Egypt too. Or few survivors of war must have settled there and continued their race for some time. 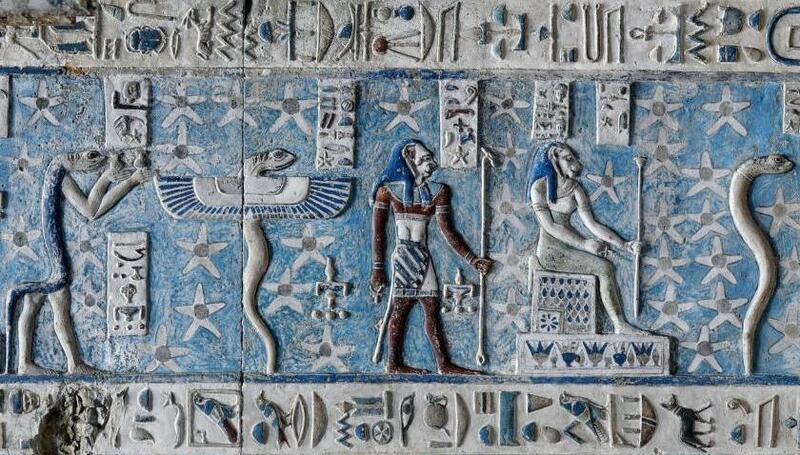 This temple of Tentyra even depicts snakes with human like hands, wings and walking on 2 legs. Birds and dogs with human bodies are also seen. 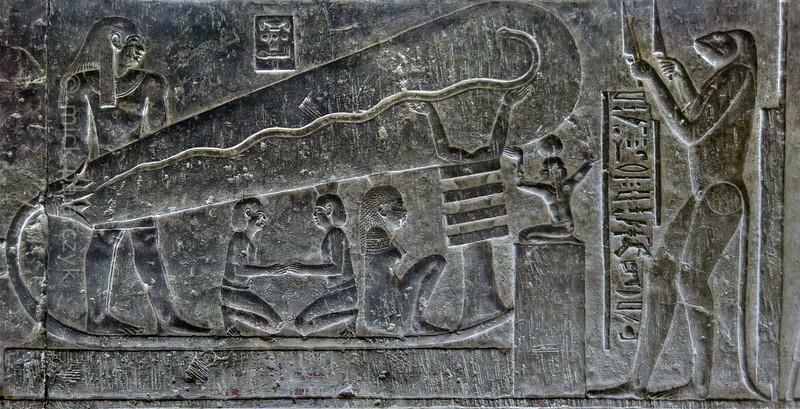 Many such carvings prove that people travelled between India and Egypt for more than 4000 years.